Katie's son was in the same class as mine when they started kindergarten 4 years ago. We have the same background for our professional training, and so are speaking the same kind of 'language', more or less. And of course, we get along well. Katie had a few attempts at getting this one quilt finished over a span of 10 years, but was unsuccessful. When she first showed it to me, it was partly quilted by a domestic machine. So, I encouraged her to keep going. I even lent to her more pins to pin the quilt.! And, off she went home with the quilt AND more pins.!! Not long after, I have had a think about the quilt a bit more and made an offer to quilt Katie's quilt on the condition that she unpicks all the quilting that was done, so far. A few months later, Katie brought the quilt back to me. 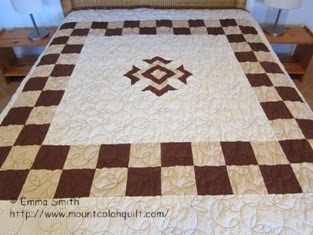 I had it for a while before getting around to quilt it as I was keeping busy with quilting for my clients. Katie's quilt is now done and looking beautiful. There is substantial amount of negative space on the quilt top, so the quilting pattern shows up very nicely with darker colour thread. 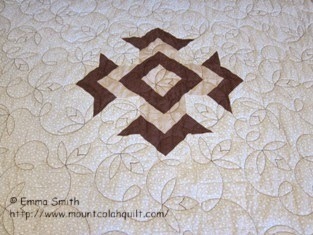 I chose the quilting pattern named 'rosebud_e2e' by Sharon Sweetland for the quilt. Katie's cutting and sewing skills were very good considering it's her first attempt at making a quilt as the quilt top was almost perfectly square [every longarm quilter knows that perfectly square quilt top is hard to come by because fabric does stretch, naturally]. So, quilting this quilt was a breeze for me (and my wonderful Gammill Statler). Katie is now handsewing down the binding, which I also attached for her. I'm pleased to hear that she is very happy to finally have the quilt to snuggle up with this winter.